Childhood can be a very complicated period if you take into account the family context of oneself. 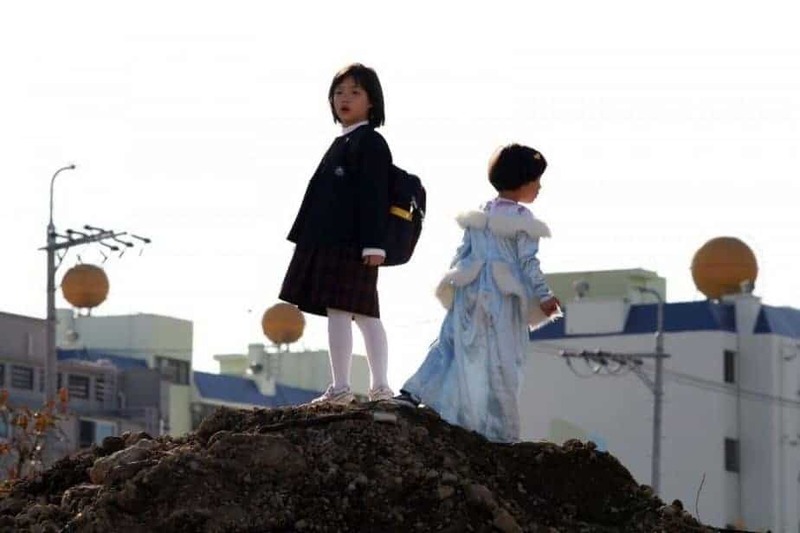 It may be that the protagonists of the film (Hee Yeon Kim and Song Hee Kim), the sweet and tender Bin and Jin, are not truly aware of what they’re going through, and it is not until adolescence or even adult life where they will realize how much they have suffered. “Treeless Mountain” is a moving story about the survival of two girls in a hostile environment after their mother disappears. Bin (Song Hee Kim) and Jin (Hee Yeon Kim) have been abandoned by their mother, and they find themselves in a house of a relative with whom they have had little contact, but their mother promised them to return when their piggy bank is filled with coins. It is obvious to say that the girls try to make that piggy bank full so that the promise of their mother is fulfilled. They are very small to carry out their new life, but the bumps of daily life teach them to mature and value their day to day. The sensitivity and closeness that So Yong Kim shows in the narration of this story is noteworthy, bordering on the documentary style, but with cinematic language. The Close-ups are abound in the film from start to finish, bringing us closer to the essence of the story and the emotions of the characters, especially to Hee Yeon Kim’s soul, where we can always see his face in complete detail. So praises to the cinematographer Anne Misawa for the beautiful camera work put on the film. It is to praise also the work of the actors, especially the two protagonist girls played by Hee Yeon Kim and Song Hee Kim. Both fill the film with an admirable tenderness. The film focuses on the main character’s lives to such an extent that for an hour and a half we recognize how the world was during our childhood. A world in which the absence of a mother, at the door of the school, upon arriving home, was a tragedy. The story almost does not exist, what exists is the look. So Yong Kim does not merely bring up the theme of lost innocence; this is not merely the film of two girls who, abandoned by their mother, are cared for by an aunt, negligent and alcoholic, and later by their grandparents. “Treeless Mountain” is so poetic, sincere and exciting, that one could say that it is based on real experiences of the director herself, and although I don’t know that exactly, it is certain that So Yong Kim feels an enormous affinity to the protagonists of the story. “Treeless Mountain” tells more with images rather than words: with a passing cloud, with a post that blocks our gaze. With that, we already feel the loneliness of the little ones. For making us feel again the heartrending feelings of a child.